Are you ready for an amazing adventure? We have been working hard all Winter to develop a new epic California Island Adventure for you. This multi-day trip departs from Santa Barbara harbor and cruises to 3 of the areas beautiful, pristine Channel Islands. Guests will see amazing wildlife, kayak sea caves and snorkel in hidden coves. Food, charter boat lodging and activities are all included – you just need to bring your backpack and sense of adventure for this trip! This is truly a unique experience and the best way to explore the most remote and often inaccessible parts of the Channel Islands National Park. This multi-day trip includes a variety of once in a lifetime experiences and is perfectly suited for those that are active and adventurous. The islands and surrounding waters are home to many amazing endemic animals and plants as well as archaeological and cultural resources that you will not see anywhere else in the world! You will have plenty of opportunities to kayak, hike, snorkel, SUP and more. All of your food and accommodation is taken care of so you can fill your trip with maximum amounts of adventure and relaxation. When does this trip run? There are 3 trips scheduled this season. They are June 14th-16th, July 5th-7th and August 4th-6th. Space is limited on each. The day before – check in at the Sea Landing at 8pm and get your gear on the boat. Meet your guide and the crew and you are free to make your own dinner plans in Santa Barbara. We leave the dock at 4am tomorrow so you are welcome to sleep on the boat tonight to avoid having to get up before dark! Day 1 – Depart Santa Barbara Harbor early and wake up en route to San Miguel Island. Enjoy a hot breakfast on the boat before gearing up and receiving an orientation and safety briefing from your guide. Explore the extraordinary caves and coves around Harris Point and Prince Island. Take in the abundance of marine life – sea lions, harbor and elephant seals abound – before landing at Cuyler Point and hiking with a qualified naturalist to Lester Point. Enjoy a relaxing afternoon of snorkeling from the boat and then head out for a short kayak or relax on the boat with your favorite beverage in hand to watch the sunset! Day 2 – Kayak from Carrington Point to Bechers Bay on Santa Rosa Island, exploring the amazing kelps forests and crystal clear water before returning to the boat for lunch. Head out after lunch on one of the many great hiking trails and experience the ancient forests and stunning vistas. In the afternoon jump back on the boat and head to Forney’s Cove at Santa Cruz Island for an afternoon snorkel or sunset kayak. 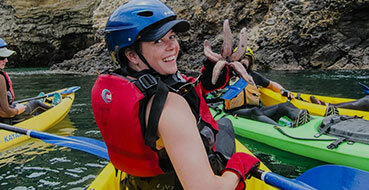 Day 3 – Explore Santa Cruz Island and experience the world’s second largest sea cave – Painted Cave! Enjoy a downwind paddle from Emerald Bay to Painted Cave before jumping back on the boat and enjoying lunch. Snorkel around some of the best diving spots in the world before we head back to Santa Barbara. Our standard rate is $1349 per person. You can save by planning ahead. If you book 30 days prior to the departure the cost is $1249. Additionally, if you have a group of 4 or more people the group rate is $1124. You can’t combine discounts or use other promotional codes with our discounted rates. Book today and receive Early Bird pricing of $1249! Come explore with us. You will remember this adventure for the rest of your life! Read all the details at Channel Islands Multi-Day Island Excursion.